Children want adults to show more respect for each other, as worrying numbers of 11 to 16 year-olds witness adults setting a bad example by bullying and disrespecting each other. The results of a poll, published by the Anti-Bullying Alliance ahead of Anti-Bullying Week 2018, suggest that over four-in-ten children (41%) have seen adults bullying each other during the last six months, with an even greater number (60%) witnessing grown-ups being disrespectful to other adults. Children said they saw much of the adult bullying take place face-to-face (21%), but had also come across it online (18%) or in the media (20%). More than 4 in 5 of the children polled (87%) also reported having seen children bullying each other. The majority (76%) had seen this happen at school, with a third (34%) seeing it online and a quarter (27%) seeing it in their communities. The results come as children continue to suffer on the receiving end of hurtful behavior. Nearly half of the children surveyed (45%) said they had been bullied face to face at least once during the last six months, with over a third (34%) saying they had been bullied online over the same period. Worryingly, the equivalent of one child in every classroom (4%) said they had been bullied face-to-face or online every day over the last six months. However, nearly all children surveyed (98%) said that showing respect to each other is important and that it is possible to be respectful even if you disagree with someone else. 97% said adults should set a good example and show more respect for each other. The Anti-Bullying Alliance, with the continued support of SafeToNet, is encouraging everyone to ‘Choose Respect’ during Anti-Bullying Week. The campaign, expected to be supported in approximately three-quarters of schools in England, takes place from 12 to 16 November. CBeebies star Andy Day and Anti-Bullying Alliance patron, and his band Andy and the Odd Socks, have launched a new song in support of Anti-Bullying Week 2018 and are encouraging students to wear odd socks to school during the campaign to show their support and raise money for a good cause. On Thursday of Anti-Bullying Week, the Anti-Bullying Alliance has teamed up with The Royal Foundation and The Duke of Cambridge to support their Royal Cyberbullying Taskforce to shine a spotlight on cyberbullying by holding ‘Stop Speak Support Day’ which encourages young people to become upstanders when they encounter bullying online. 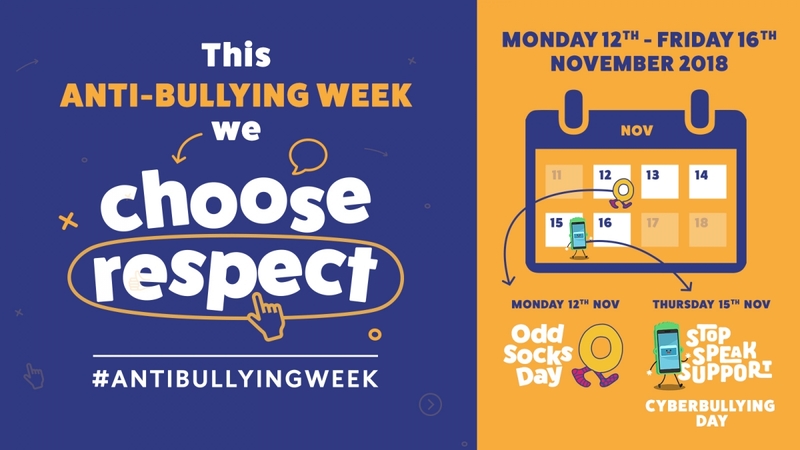 Anti-Bullying Week runs from 12 to 16 November 2018 – get involved at www.anti-bullyingalliance.org.uk / @ABAonline: #AntiBullyingWeek #ChooseRespect #OddSocks. A poll of one thousand 11-16 year olds shows 97% would like adults to show more respect for each other. 41% of children have seen adults bullying each other during the last six months. Children themselves continue to experience bullying: nearly half (45%) say they have been bullied face to face, and 34% online, at least once during the last six months. The equivalent of one child in every classroom (4%) said they were being bullied face to face or online every day. Nearly all the children surveyed (98%) said that showing respect to each other is important and that it is possible to be respectful even if you disagree with someone else.